No SERIOUSLY, Who The Hell Are O’Leary Analytics? They’ve been monitoring the global coverage (including social network/ Twitter interface) of the Cowen story. They just got a mention in the Washington Post. No. He is O’Leary Analytics. How did he get on in the Junior Cert? He has degree in journalism and Media Communications from Griffith College Dublin. After graduating he went to Cork and worked on the Irish Examiner. 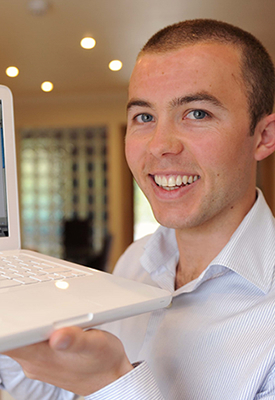 After the Examiner he returned to Dublin to work with Meltwater, a Norwegian software company. He launched O’Leary Analytics in November 2009. O’Leary Analytics apparently acquired a license for a new social media monitoring tool. We can find no record of such a device. But Stephen says it opens up a listing of “over 220 million sources, including blogs, Twitter, Facebook, YouTube, and message forums. Information that can be monitored and analysed: sentiment, ‘demographics, readership, geographical spread, key influencers, and the comparison of campaigns’. So he just uses Google like the rest of us? So who monitors the monitor as he monitors? Will he come and work for us? Posted in Misc, News and tagged Cowen, social network at 4:45 pm on September 16, 2010 by Aaron McAllorum.